The Student Government Association voted on the approval of clubs, heard public apologies about a potentially embarrassing photo and heard a progress report on the recently passed Information Technologies resolution. During the announcement section of the SGA meeting, current Vice President of Legislative Affairs Parker Smith apologized for the posting of a “potentially embarrassing” photo to social media by his friends. Smith also apologized for any negative light shed on SGA through these actions. Smith’s roommate, Senator Bradley Deal, also stood up to talk on VPLA Smith’s behalf. “VPLA Smith had nothing to do with the picture posted that was potentially embarrassing to the SGA; He was simply not wearing his pants yet,” Bradley said, according to the SGA minutes. Senior human services major from Ozark, Artez Jones declined to comment on the issue. “I have no education or knowledge about that incident,” Jones said. Jones is not the only member of SGA who was unaware of the photo being posted to social media. SGA’s work within the Trojan community was not interrupted as an update was given on the recently passed Information Technologies resolution. Patrick announced that she and Vice President of Campus Activities Cody Farrill met with the IT department to discuss the resolution on behalf of the students. The reason that the limit on devices exists is because of the expense of the university to provide that much bandwidth. Due to Troy’s location being outside of a larger urban area, it is a financial burden to have excess to extreme amounts of bandwidth. Patrick did announce that the IT department will consider allowing the addition of a third device to the university network for students. Also IT wanted to clarify that there is a difference between the academic and residential networks, and that the network logout button has been fixed. 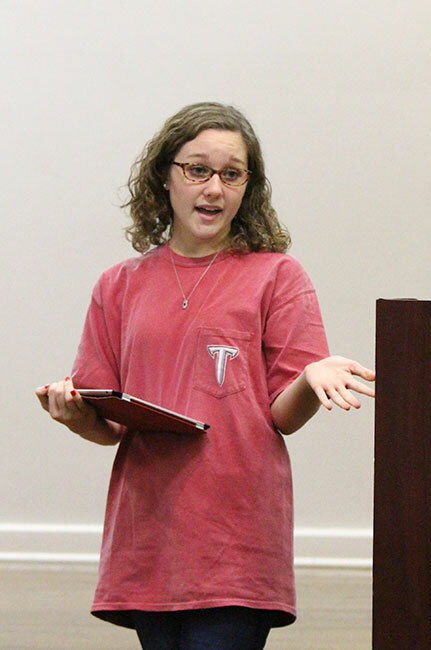 SGA also approved the formation of a new documentary club at Troy University. The club’s resolution was amended by the SGA, regarding the dues members would pay after consulting those in charge of the new club. Although SGA passed the resolution, it was not unanimous. Jones did not want to discuss his vote regarding the passage of the resolution. Patrick was not in attendance the week before so remained silent during the voting because she did not feel informed enough to vote yay or nay. SGA placed a new resolution on docket for next week about the formation of the International Bilingual Association. Senior foreign language major from Mill brook, Rj Stephens spoke to SGA about the club.